Lucy's Soup Can: Happy Saint Patrick's Day! Look at the mess I woke up to this morning! Apparently Leprechauns visited us last night! My children are running around the house looking for them. My daughter is positive that if she sees one, she can keep her eyes on him until he leads her to gold. She's been practicing. St. Patrick's day always gives me spring fever. 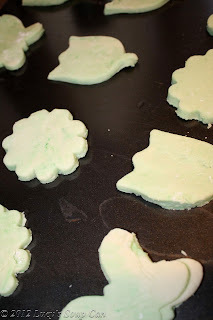 Earlier this week, I thought it would be fun to make some spring-inspired sugar cookies and let the kids decorate them. (We colored them green for St. Patrick's day). "May the Lord keep you in His hand and never close His fist too tight". Happy Saint Patrick's Day! For the sugar cookie recipe, go here (note: I didn't want "poofy" ones this time, so no creme of tartar), and for the icing recipe, go here. How fun! I love the green pancakes. They actually look very tasty being green. We're keeping it pretty mellow here for St. Patty's day. this is gorgeous, love the cookies! thanks for visiting my blog, for your lovely comment on my spring wreath and for following! am following you back. What cute cookies! My sugar cookies never look that good! Stopping by via the live laugh rowe blog hop. Your blog is awesome! Following via GFC. Hope to see you around www.bearrabbitbear.com soon!